One of my nicknames in high school was Trendy Wendi…thanks Tiffany Wilson, sorry I didn’t see you at the reunion last summer. The funny thing about that is that I am, and have always been, so far behind the times that it’s not funny. I’ve never been a gauge of what the “cool kids” are doing. I was still inching along with dial up when most of the world was running at lightning fast dsl speeds. Seven years ago I tried to convince The Mistah that Tivo was nothing more than a glorified VCR, a passing fad, when he said he wanted one. And sometime in the 90’s when an ex was gushing over something called an MP3 player, I couldn’t understand the hype. It is safe to assume that I have come to see the light on all these things. I’m just not what you would call an “early adopter” of technology. I’m same way with food too. Sure, I know trendy recipes like “No Knead Bread” are out there. But by the time I get around to finally jumping on the bandwagon, it’s moved on to the next big thing. And that’s ok with me. I like to be able to take my time and decide without a lot of pressure from everyone else whether something is worth the hype. Sometimes, the answer is yes. Sometimes, it’s no. But I want to decide for myself, thank you very much. Maybe it really is the best thing since sliced bread but I’m not going to try it until I’m good and ready to. Yes, I am stubborn like that. The way I see it, when a recipe gets pulled out of the folder, the Universe is telling me that it’s the right time. It doesn’t matter if it has been in there for three weeks, three months, or three years. The Universe is pretty smart about these things. It knew that The Mistah’s birthday needed a special treat. 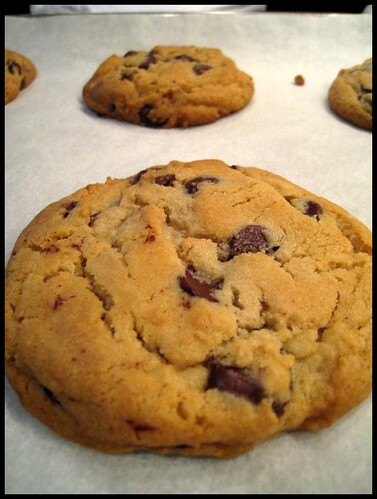 It knew that I had not yet tried the latest NY Times recipe that was all the rage – Chocolate Chip Cookies. So it managed to get us both together in the same place at the same time. So what’s the verdict? Are they worth the hype? You’ll have to decide for yourself; I’m obsessed with trying to find that Benetton rugby shirt that I wore to death in high school since the 80’s seem to be making a comeback. Who knows, maybe I’ll finally be trendy after all. BAH Note: I found it to be much easier to weigh out the dry ingredients than to measure by volume. If you have a kitchen scale, it’s worth using for this. Also, the recipe calls for a standard 3 fluid ounce size ice cream disher as the portion size. I should warn you that this makes a HUGE cookie. I am not exaggerating when I say you will end up with cookies 3 to 4 inches in diameter. Using a smaller ice cream disher (I guess about 1 fluid ounce) worked ok and produced average size cookies. But I think the solution is to actually use two smaller scoops worth. If baked correctly, the cookies will be soft. Don’t be tempted to let them get too brown in the oven. When I used a standard disher, the baking time was approximately 18 to 20 minutes. When I scaled back to a smaller disher, the time was more like 14 to 16 minutes. I imagine that two small scoops would be somewhere in the middle. Lastly, this dough needs to sit in the fridge. The recipe says 24 to 36 hours. The best I could manage was about 18 hours. Really, it was all I could do not to pick at the dough so I think I was lucky it got that much time in the cooler. Combine flours, baking soda, baking powder, and kosher salt in a bowl. Whisk to combine. Using a stand mixer fitted with a paddle attachment, cream butter and sugars until very light and fluffy, about 3 to 5 minutes. Add the eggs, one at a time, mixing well after each addition. Mix in the vanilla. Scrape down the sides of the bowl as needed. Reduce the mixer speed to low then add the dry ingredients (BAH Note: be prepared for flying flour because this step will be kind of messy) and mix until just combined. Add the chocolate chips and mix to just combine. Transfer dough to a gallon plastic storage bag or press plastic wrap against the dough in the bowl and refrigerate for 24 to 36 hours. Heat the oven to 350 degrees and line a baking sheet with parchment paper or a nonstick mat. Using a standard size ice cream disher, scoop six mounds of dough onto the baking sheet, making sure to space them evenly. Sprinkle lightly with sea salt (if using) and bake until just staring to turn golden brown, but still soft, 15 to 20 minutes. Transfer baking sheet to a wire rack for 10 minutes then transfer the cookies onto the rack to cool completely. Those cookies really are good, aren’t they! Isn’t it funny that all of our men have birthdays this month?!? Elizabeth, they are some good cookies. But in light of the fact that I don’t blog in real time, I should fess up and say that I made these for The Mistah’s b’day back in November. They also ended up in the Christmas cookie packages that I sent out over the holiday. While I’ve never tried the exact recipe above–it would require that I buy dedicated bread flour, and we all know I already have a flour problem–I have tried several of the tips the article recommended, including letting the cookies rest in the fridge and adding some sea salt to the tops. I think the real secret is the fridge resting, and now I really don’t like to make chocolate chip cookies without letting them have their time in the fridge. During the recent blizzard I had a situation that demanded IMMEDIATE chocolate chip cookies, so I used a martha recipe that didn’t call for any fridge time (my go to recipe, from the Baked cookbook, demands it!). The cookies were good, but as a test I reserved some dough in the fridge to be baked two days later, and those cookies were AWESOME! Fridge time really does mean better cookies! Beth, have the various flours taken over your 990 sf yet? I completely understand the space constraints. And in spite of having them myself, I have too many different flours in the pantry – pastry, cake, bread, all purpose, and some old white lily that I really need to replace. So now I’m wondering what to bake up if Snowicane strands me at home tomorrow. Tracy had a peanut butter cookie posted this week that I might investigate. Or I could pull out another Retro Recipe. But unfortunately, I think I need to make a run to the store before heading home today. I’m so over winter. I suffer from the inability to wait for chocolate chip cookie dough to rest. It really pains me. Tracy, there’s a simple solution. Make a batch of your peanut butter cookies to tide you over while the chocolate chip dough rests. I’m all about easy problem solving solutions! Don’t rush out to the store after work. It looks like this storm isn’t going to be much of anything, maybe six inches at the most. There’s just too much model inconsistency to be absolutely certain of that, but I don’t think we’re in for a big one. Did I mention my other hobby is amateur meterology? Beth, that’s quite a resume you’re building. I have a secret strategy to try and avoid grocery store mayhem today. I’ll weigh in with my verdict later. Since my neighborhood is lacking in grocery options, I’m going to pick up the bare minimum to fill in a few gaps in my menu should the storm turn into a monster. You actually mean that TIVO is NOT a glorified VCR? I could be in lots of trouble here! Emily, I have seen the error of my judgmental ways when it comes to Tivo. Ours lets us tape two different shows at the same time or tape one show while watching another. Tivo has become one of my bff’s and is worth every cent. Although it has contributed to a severe decline in my reading comprehension and attention span.